I have been meaning to post this a lot sooner, but better late than never!! 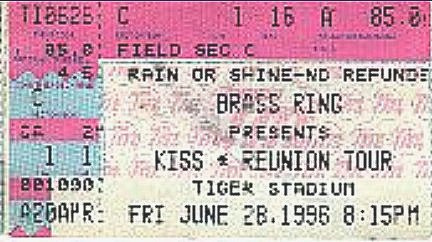 Anyway, it was noted on KISSFAQ sometime ago, that a full version of the 6/28/96 Tiger Stadium show was posted. This was the official kick off of the Reunion tour. If you have not checked out the show, you can do so here. I had only seen the pro shot that has been out for a long time (only 7 songs), so I grabbed a youtube downloader, put it on my tablet, and watched on breaks at work! This is why there are bootlegs!! I was not one of the lucky people to see this show live, but man, watching it now really kind of put me there. This is by no means the best bootleg out there picture or sound wise, but this one gets the job done. You never got the feel of the crowd on the pro shot version, but this one gives you an idea of what it was like to be there that night! Sound wise I would give it a 6 or 7. Sometimes the vocals are bit muffled but for the most part, it’s really good. Picture wise I would only give it a 5 or 6. It’s shot from far away and sometimes it’s a bit blurry. When the taper gets focused…it decent. But having said all that, this is a good example of enjoying a not mint show. This show has its own special place in KISSTORY…so set back and enjoy!! Gene is acting like the Demon of old!! Amazing! Really miss the amps rising up on the stage….always liked that! Always love the extended ending….great! Never been a big fan of this song live, but it sounds really good!! Gene seems to be really into the show! Weird to see Paul & Gene lean on each other while they are playing. Can’t remember a time when I have seen that lately!! Ace sings the second verse…nice! WOW! The was Paul dropped to his knees was impressive!! From what I could tell (and I am sure I am wrong) first pyro on the stage! When the crowd sings is VERY loud!! Actually, the best version of the song I have heard in a long time! This need to me in the show NOW! This sounds so awesome live! This is a KILLER version of the song! Straight forward, really rocking song! Paul is full of energy during this song! Watch Gene just lurk across the stage…so 70’s to me! Killer to see Ace & Gene rocking in time with the song again! Sounds like the song almost falls apart after the first chorus..drums just sort of stop. Very cool watching just Ace & Paul play the into together! Crowd goes CRAZY when he flies! This is the Reunion lineup at it’s best! If you watch Peter during this song…looks like is playing his heart out! During the solo for a minute or so..it looks like the Peter of old! Looks like Peter is having a blast during his solo! Again, if you watch Peter he looks like he is having the time of his life!! They flash the words to the song on the screen during the sing along….in case someone does not know them I guess! LOL! Miss the days of Paul throwing out his guitar to the crowd instead of selling it! Wow..the ending was fucked up! I think Peter cries at the end of song…touching. Paul is still full of energy..unreal! How far out over the crowd does the lifts go at the end of the song! !